Born near historical Bukhara in Uzbekistan, Yulduz developed a passion for the traditional song from a very young age. Success came early. After leaving school, an unwavering commitment to her passion led her to the Tashkent Conservatory, where her singing was further refined. 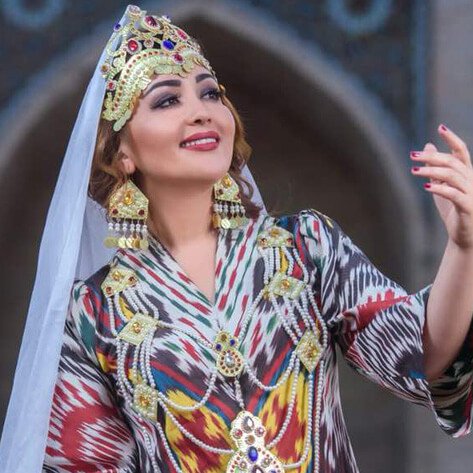 She is not only a rising star of Uzbek classical singing (yulduz means “star”) but is also known for her repertoire of Bukhara (mavregi) and contributes to its restoration and propagation. In 2006, during a tour in Europe, she proved that she was also able to sing in the Persian style, but in her stylised manner, both in ornamentation and rhythm. Her rendition amazed the discerning Iranian fans, who are usually not so open to stylistic innovations. Although there are many brilliant singers in Uzbekistan, Yulduz stands out because of her exceptional musical qualities and her adaptability to diverse classical genres. Her communicative personality and the natural joy of singing which comes across in her performances, have enabled her to gain fame on the international scene. Her artistic instinct, her radiating presence, her charm and her human qualities all combine to suggest that she is a diva predestined for worldwide stardom.